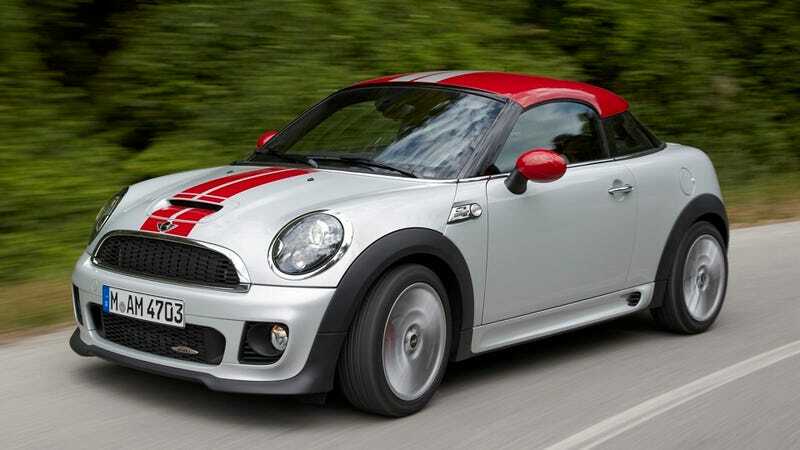 The Mini Cooper Coupe is like "Sup, Brah!" We already knew the Mini Cooper Coupe was coming to the U.S. market, but now we've got the first fully unclothed shots of the new two-seater from BMW's itty-bitty car division. And what we see with the camouflage off is the most frat boy-looking car we've ever seen. Seriously, the little Coupe looks like it's wearing a backwards-facing baseball cap. With a mouth wide enough to down an entire can of Hamm's Ice Light faster than a bolt of lightning, we're just waiting for it to hit the Quad for a ragin' kegger. Be that as it may, it's still a cool little package and we can't wait to get our first drive of the two-seater in John Cooper Works trim. And in that trim package, you'll get a 1.6-liter four-cylinder gas engine with a 121 hp output at 6,000 rpm and torque of 118 lb-ft at 4,250 rpm. That'll help it go from 0 to 60 in just 8.3 seconds and give it a top speed of 127 mph.